I work out side my home at a great job that pays for the bills, but some times when I get emails from my bosses; I ask myself why do they need to send that email? Two examples are: "Great job on meeting/exceeding your daily minimums!" or "Thank you for staying on phones for the whole hour! You rock!!" Then after I read the emails; I ask myself really is there a problem with not meeting the daily minimums or staying logged into an hour phone shift that my bosses need to send an email stating you were above the rest for that? I liken it to the choking warnings on labels on items that anyone with common sense knows that putting a small parted object next to a baby is wrong. Don't get me wrong. I know those labels are needed by law, however on some times I say to myself "who did this to get it placed on the label?" I guess having a work ethic is very low on the priority scale with other co-workers as my bosses have a need to send out these and other types of emails highlighting basic work skills that should be expected and not a chance to gain highlighted excellence from upper management. I guess every job has the "Why did they send that email?" from Management once and a while however I feel like the job I have now does it a lot more often then the standard one or two per quarter. That is what I said to my stunned daughter as we sat on the steps of the Playskool Sesame Street steps in the morning of day two of Blogher 2011. 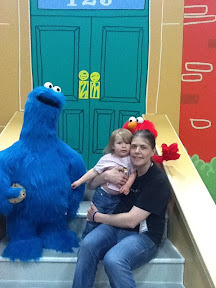 I think the life size representations of Cookie Monster and Elmo were a bit too much for my two year old however she did warm up to the booth a little after this was taken. 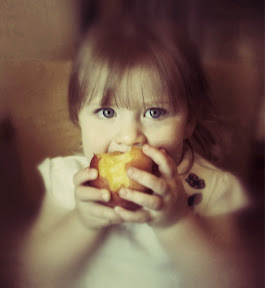 She was a sparkle at the Jimmy Dean booth where we both took the "No Kid Hungry Pledge" and there she warmed up to the camera while trying to take the prop apples with her. After this picture we walked back outside to the arms of her daddy as he didn't have an Expo pass. He also had other obligations with family and friends that were looking forward to seeing Bella. After that I braved the Expo alone with a few thousand of people swarming to different booths for different reasons. As I sit in my hotel room bed with both my daughter and husband fast asleep, and me with pregnancy heart burn, I wonder how Blogher 2011has affected my life in just one day. 1. The conference is way cooler than E3 (even with the booth babes), however I still have yet to go to a party (that's for day 2!). 2. I find myself in a whole new league of motivation and being in my 3rd or 4th year of having this blog, I can still evolve to something better. 3. People that you follow on twitter are genuine and do actually match or exceed expectations in real life. 4. You get what you need from Blogher 2011. There is no experience more than your own and what you put into yourself after the fact. 5. Swag. Yes I went there. It's awesome to see my two year olds face light up after a long day with toys from Playskool and a Google+ shirt and snacks for a tired husband. Not to mention some Mommy items for myself! I will place those under Self Care so I feel no mommy guilt! 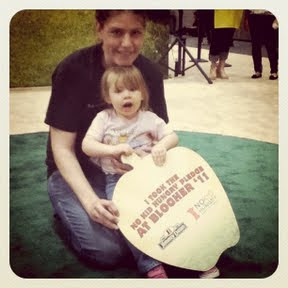 Now I should go to bed my heart burn has died down a bit and I have more Blogher to go to in the morning. I wish a good night to all!